This episode is by far the most depressing but satisfying episode yet (in my opinion). Although there were many bad bad bad problems that arose in this episode, there were also many good good good things that I absolutely loved and needed to make myself feel better. Episode 12 remains as proof that if you’re not watching this drama, then you’re missing out on some very very good stuff. Haha. When episode eleven ended, there was an intense confrontation between Min Suk and Director Yoo, with Min Suk wanting to talk to Soo Young but Director Yoo defending a reluctant Soo Young who’s not so opened towards that idea. Before anything bad happens, Soo Young interrupts the two men and state that they should stop before people see them and create a huge commotion and therefore cause Soo Young to not get married. LOL. I love how she’s just like, stop fighting or else I won’t get married! Such a funny excuse to stop the two men to fight. It just shows that even during a heavy atmosphere, Soo Young is still the same old clumsy person she’s always been. Yay for character consistency! Soo Young eventually leaves so the two guys both head back home. While walking back, Min Suk questions Director Yoo’s intentions, but Director Yoo simply states that his intentions this time are sincere (or at least that’s what we’re made to think). While driving in his car, Director Yoo drives through a puddle that gets Min Suk wet which causes Min Suk to continually use foul language to express his anger ( it’s quite amusing how unlimited Min Suk’s vocabulary when he curses. Haha). While visiting his mom in the hospital the next morning, Director Yoo calls his dad to inform him of his mother’s state. It’s up to his dad as to whether he wants to visit Director Yoo’s mom or not, but Director Yoo called to just tell him anyways. Min Suk is at his house eating breakfast with Grandpa when he’s suddenly reminded of the incident last night where he witnessed Soo Young hugging Director Yoo. This causes him to grow frustrated and annoyed so he stops eating and covers his eyes to rage. After a few minutes, he asks Grandpa to hand him a cup of water, but when he receives no response, he lifts his head up to find Grandpa gone. Uh-oh. Soo Young encounters Grandpa while walking about her neighborhood since she’s returned from Gangchon. They go search for his house where Grandpa ensures her that he definitely knows his address and where he lives this time. While walking, they come across a concerned and worried Min Suk who in search of his grandpa. When they meet, Grandpa introduces Soo Young to Min Suk and reveals to him that Soo Young is the ‘pretty unnie’ he’s been talking about all this time. Lol, so cute! She drags Soo Young with him to their house to eat some watermelon together. While Grandpa eats his delicious watermelon, Min Suk brings up the topic of Soo Young hugging Director Yoo and whether they have something for each other, but Soo Young doesn’t answer Min Suk because it’s not like they’re in that kind of relationship anymore to feel jealous about the other person. With that, Min Suk pleads for Soo Young to come back to work. If she’s such a cool and modern woman who can draw a line between public and private matters, she shouldn’t feel uncomfortable around Min Suk. She considers his request before leaving the house. When she gets home, she is greeted by Yoo Ah who asks if she’s made up her mind, because you know, she did go on this trip to clear all her thoughts. But Soo Young implies that she didn’t use the trip to make her up mind between which guy she wanted. Yoo Ah calls a grumpy Director Yoo who sounds like he doesn’t want to talk to Yoo Ah to inform him that Soo Young has returned from Gangchon while Soo Young heads back to work. She’s Jung Soo Young and she is capable of anything because she’s a cool and modern woman. Soo Young plans to tell Min Suk straight up that they can’t date and that it won’t work out. Everyone grows suspicious of Dae-han and Yoon-joo who arrived at the office at the same time, with Yoon-joo wearing the same outfit she wore the day before and Dae-han suffering from a nose bleed. Their attention is diverted to Min Suk though who enters not too long after. He notices that Soo Young’s returned to work so he smiles and giggles over her appearance. She enters his office to read off his schedule for the day and to tell him that he must address her as Noona or else she won’t work for him. Haha. Min Suk doesn’t seem to like the idea of calling Soo Young ‘Noona’ and no matter how many times Soo Young tries to force it upon him, he doesn’t abide by her request. Lol. However, Min Suk finally calls Soo Young ‘Noona’ when he can’t take it any longer. He stutters hesitantly at first and when she doesn’t like how he’s not saying it loud enough, he starts yelling ‘Noona’ out loud 50 times in a row to which Soo Young’s just like, “Why are you yelling it out so loud?” Hahaha. 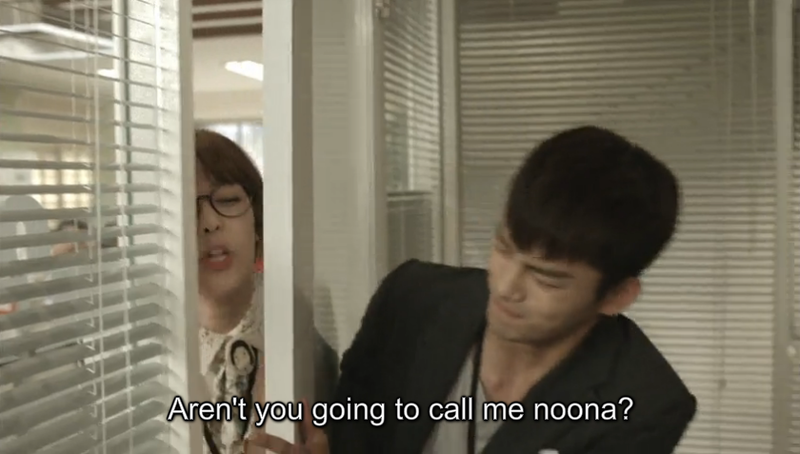 He asks her why he has to call Noona. Is it because he’s too young? Soo Young doesn’t answer his question though and walks out of the COMFO building where she gets into Director Yoo’s car that has just arrived at that same exact moment. Together, they head off to the hospital to visit Director Yoo’s mom. Director Yoo introduces Soo Young to his mother and eats the red bean porridge that Soo Young’s made just for her. When Director Yoo’s mother notes that Soo Young’s the first girl to be brought to the hospital by her son, Soo Young quickly proclaims that they are just co-workers working for the same company and that they’re not in a relationship. Her answer is frowned upon by Director Yoo and his mother. Hahaha. Once she’s gone, Director Yoo’s mom acknowledges Soo Young as a very cute person and expresses her gratitude for Soo Young because she taught her son to fall in love when she thought he would never do that because of the things he witnessed between his parents as a young child. Another thing Mom acknowledges is Soo Young’s cooking skills and the porridge that isn’t so good. Haha. While leaving the hospital, Soo Young catches a glimpse of President of COMFO entering the hospital. She grows surprised to see him there, but keeps her mouth shut and doesn’t tell Director Yoo anything. Meanwhile, when President arrives at the room, he peeks inside to see Director Yoo’s mom standing there looking healthy and fine. He doesn’t have the nerve to go inside, so he walks away. Right when he turns the corner and disappears, Director Yoo appears from another corner to return to his mom’s room. Talk about wrong timing! Damn, so close Director Yoo! SO CLOSE. There’s a serious and intense hockey game going on at the hockey stadium. Min Suk gets severely injured when one of the players from the other team crashes into him and pushes him against the wall, causing him to slam his face. He is transported to the hospital to receive treatment while his two best friends, Min Suk’s dad, and Yoo Ah wait outside of the emergency room eagerly for him. When he’s finished with his surgery for which he got for his shoulders, he is bombarded with questions from his dad and Yoo Ah, but he reassures them that he’s fine. “This is so embarrassing. It’s not like I’m dying here.” Hahaha. Gotta love Min Suk and his witty attitude. Soo Young calls the owner of the apartment she’s living in to notify her that she wishes to move out of the apartment since her lease is almost up. Does this mean Soo Young won’t be living near Min Suk anymore? Team Leader Kim finds out that Min Suk’s received shoulder surgery and therefore won’t be able to come to work so he lies to the Retail Team that Min Suk’s come down with the flu to cover up for Min Suk’s absence. AM Yoon also asks Soo Young if she’s made up with Min Suk yet (apparently he knew all along that they were dating), but Soo Young replies that they haven’t yet. That day while walking back home from work, Soo Young texts Min Suk to ask him on his current state, but still feels awkward and uncomfortable in asking him so she doesn’t send the text. She also notifies Yoo Ah that they will be moving out. Soo Young wishes to start anew and fresh in a new house. She soon leaves to go to the store while Yoo Ah calls Tae Suk who’s at the hospital with Min Suk to remind him to not make things hard on Min Suk. 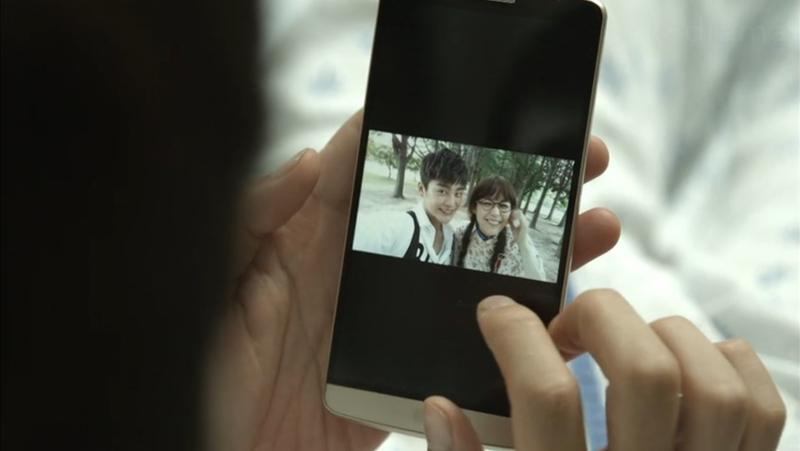 At the hospital, Min Suk looks over the photos of him and Soo Young taken during their getaway trip to Namiseom and grows nostalgic just glancing at the pictures. Meanwhile, Soo Young can’t help but wonder about Min Suk and what he’s up to while returning from the store. She’s so busy thinking about him she doesn’t even notice that she’s walking the wrong way. LOL. It’s not all that bad though because she ends up in front of Min Suk’s house and at that moment that she’s outside his house, Dad and Grandpa are preparing to go to the hospital. While Min Suk is packing his belongings to leave the hospital, Dad and Coach are talking to the doctor that performed Min Suk’s surgery in the doctor’s office. He delivers the heart-breaking news that Min Suk will not be able to play any more sports (NOOOOOO!). Upon the devastating news, Dad volunteers to give up his arm for his son so that Min Suk can continue to play hockey since that’s all that Min Suk has grown up knowing. “That boy knows nothing except hockey…I don’t need an arm. Please give him my arm,” Dad cries. Oh my goodness, this is the most heart-breaking and touching scene ever. Coach eventually tells Min Suk the unfortunate news, leaving him and his two best friends shocked and devastated. Meanwhile back at COMFO, Soo Young has news to deliver to Team Leader Kim as well. She’s resigning as Min Suk’s secretary. (Why is this episode so depressing, seriously). Team Leader Kim finds out that Min Suk won’t be coming to work that day as well so he discusses with Managing Director Han his theory about Min Suk not coming to work the past few days. He thinks that Min Suk’s lying about breaking his arm so that he won’t ever have to come to work ever again. This scares both men so they agree on giving Min Suk a fruit basket to hopefully persuade him to return. Min Suk’s packing his stuff that’s in his locker room in the hockey stadium. He hands some of his hockey gear to his two best friends before being visited by his Sunbae (you know, the one that would always yell at Min Suk for not coming to practices). He pats Min Suk on the shoulder then leaves, but even then, just a pat on the shoulder for Min Suk means a lot for he smiles contentedly afterwards. President of COMFO suffers a nightmare while going to work of Min Suk’s step father choking him for his wrongdoing. He eventually wakes up and gets a phone call on the whereabouts of Min Suk’s step father. He finds out that Dad runs a laundromat and that he also adopted both of Lee Jung Soo’s sons, Hyung Suk and Min Suk (Ahhh, so Lee Jung Soo is Min Suk’s dad. That’s what I originally thought but I wasn’t so sure). Tae Suk and Deok-hwan arrives at Min Suk’s house to visit him only to find out that Min Suk isn’t home and that no one can contact him. They also find Team Leader Kim there at Min Suk’s house where he finds out from Dad that Min Suk cannot play any more hockey because of his injury. He follows Tae Suk and Deok-hwan outside the house only to discover that the two best friends know who Team Leader Kim is because they’ve heard alot from Min Suk about him. They take a selfie first (gotta always take a picture first haha) before Team Leader Kim yells at the two guys for always calling during work hours and abusing the company card. Haha. Just in case they get in contact with Min Suk, they should call Team Leader Kim. Min Suk still hasn’t contacted them nor Yoo Ah so the three of them go on a search for Min Suk. They eventually find him at school running laps on the track. Despite sweating heavily and running out of breath to the point where he can barely talk, Min Suk continues to run. “I’ll keep running until I die.” Even when it rains heavily that night, Min Suk is still at the track. This time, he’s not running but sitting in the rain, crying because he won’t be able to play hockey anymore (brb, gonna cry in the corner for a little while). As if watching Min Suk cry wasn’t sad enough, the episode shows flashbacks of Min Suk playing hockey and proving to viewers why he is his hockey team’s ace (I swear, this episode is trying to kill me). His two friends join him in on the crying. (LOOK AT HIM. LOOK AT HIM CRY AND SOB AND WAIL. LOOK AT HOW HEART-BROKEN AND DEVASTATED HE IS TO KNOW THAT HE WON’T BE ABLE TO PLAY HOCKEY ANYMORE. I’M CRYING ALONG WITH HIM RIGHT NOW T_________T ). On his way home, Min Suk finds his dad alone at a street vendor. He joins his dad and together they eat. While eating, Dad tries to cheer Min Suk up by stating that hockey isn’t everything and that he won’t die if he doesn’t play hockey. He even suggests that Min Suk try singing and becoming an idol because there’s nothing he can’t do (which is hilarious because Seo In Guk is a singer in real life, haha). When he suggests studying, Min Suk immediately says no. Haha. Dad praises and compliments Min Suk, strengthening the father-son bond they have even more. Awww, this scene is so heart-warming. 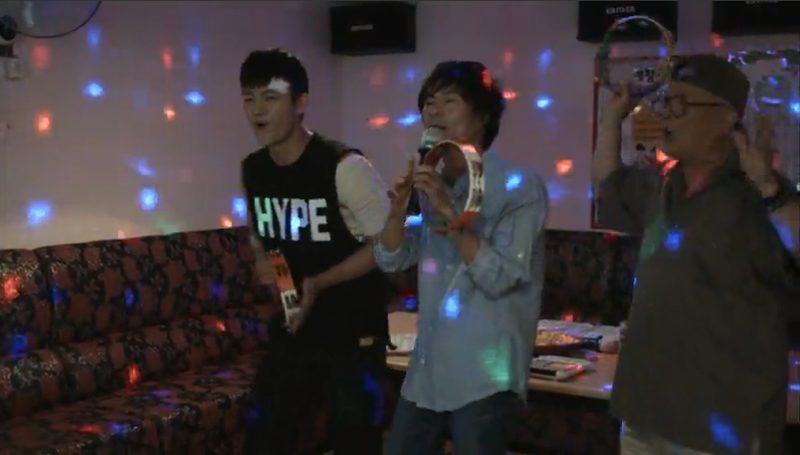 Dad, Min Suk, and Grandpa all go to a karaoke bar to sing their hearts out (OMG! 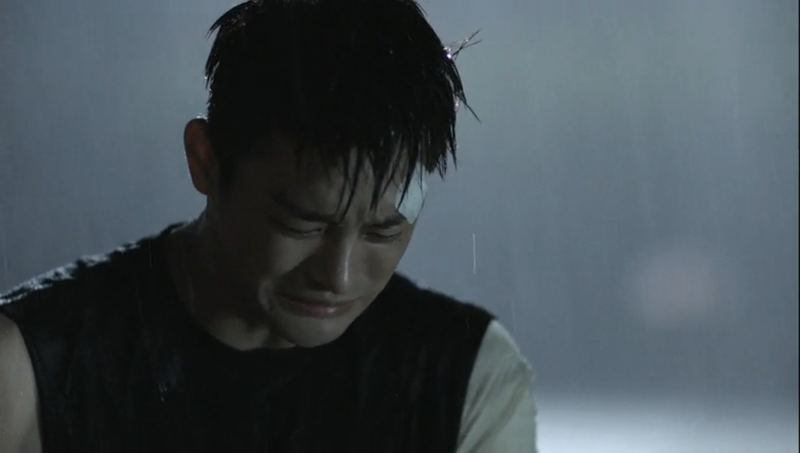 SEO IN GUK’S RAPPING AND SINGING!). When Min Suk gets a perfect score, he boasts, “I should become a singer!” OMG. YOU TOTALLY SHOULD. Haha. It’s move-out day and Soo Young are making the last final touches on packing. Yoo Ah leaves for school, but returns to the empty apartment to ask Soo Young to do her a big favor. “Go see Min Suk. He’s injured. He got injured during the game and he’s done as an athlete. He’s having a hard time, but he’s having a harder time because of you. Neither his friends nor I can comfort him. This is so frustrating and I really didn’t want to tell you this, but I think you are the only one who can comfort him right now. So go see him right now.” With that, Yoo Ah storms out the apartment. Soo Young gets in the truck with all of her belongings to head to her new apartment. While in the vehicle, she passes the same park that she and Min Suk first hung out at while drinking some beer. She also passes the convenience store that she used to work at or the street that she shared her second kiss with Min Suk and is reminded of all these poignant memories. When she’s had enough, Soo Young asks the driver to turn around since she forgot something back at her apartment. It turns out that she forgot Min Suk’s hockey puck so she goes to retrieve it and then runs over to Min Suk’s school. When Min Suk successfully sneaks out of his classroom, he walks out to exit the campus, but along the way encounters Soo Young who’s also on the school campus. Upon seeing each other, Soo Young flings her arms wide open like how he would always do to her in the past while holding onto his hockey puck in her hand. Min Suk motions towards her until he doesn’t have any space to walk any further. The episode ends with the passionate hug between our two main leads and a relieved Soo Young stating that she too missed Min Suk while they were apart from each other. I died several times in this episode. Not once, not twice, but close to 42409103093843 times. This episode was just so depressing, but satisfying at the same time. The amount of sweetness at the very end definitely made up for the sadness regarding Min Suk having to give up hockey. I honestly never thought in a million years that the drama would pull this on us. I never thought that the drama would make Min Suk land himself in a situation that would prevent him from playing anymore hockey. I had always thought that Min Suk’s only conflict was hiding his identity from others to make sure they wouldn’t find out about him so upon the news that he wouldn’t be able to play anymore hockey, I was in total shock and surprise. The drama clearly showed Min Suk to be a talented and well-rounded hockey player that the hockey team could not do without. He was the team’s ace and there were many times throughout the series that showed that. But I just thought that the only harm hockey could do to Min Suk was interfere Min Suk’s work time because there were multiple times where Min Suk would leave work to attend hockey game and practices, but him having to give it up because he gets injured? I am seriously so mind blown. It was absolutely heart-breaking watching his reaction to the news. At first he held it in and didn’t budge, but seeing him sob and cry later on over losing the one thing he’s grown up doing is just so sorrowful. He talked with his dad as if no more hockey wasn’t anything hurtful, but I knew inside that it was eating at him and killing him. You can just see the pain and anguish in his eyes when he fakes those smiles or when he cries in the rain. He doesn’t know what he’s going to do now that he has to give up hockey and I’m not sure what he’s going to do next either. Watching Min Suk’s hockey team play hockey without Min Suk? I rather not watch it at all then. Other than pretending to be his older brother, that was all that we saw of him and it’s just going to be so weird to not see him play hockey. I hate you drama. I hate you so so much for doing this to Min Suk who doesn’t deserve it. What made me feel even more awful and gloomy was when Dad was crying to the doctor to replace Min Suk’s arm with his arm. He cares and loves his adopted son so much he’s willing to give up his arm to his son so that his son can continue to do what he loves. Dad stole the spotlight in this episode because of his noteworthy and consequential actions. He knew that giving up hockey greatly affected Min Suk so he played his role as dad and did whatever he could to make Min Suk feel better. He treated him to food and spent time with him at a karaoke bar. He also cooks for Min Suk and Grandpa every day and also manages a laundromat all by himself to provide for the family. Dad’s one of those guys that would do whatever for Min Suk and I don’t think he gets enough credit for that. I don’t think Dad gets enough credit for anything he does. And maybe that’s because the drama doesn”t really focus on his duties as a father and rather just place them as daily tasks he does everyday, but when one settles down to think about it, Dad does so so much for his family. He’s beyond amazing for his sacrifices and actions and I hope Min Suk realizes just how fortunate he is to have someone like Dad and be able to call someone like him ‘Dad’, even if he’s not his biological father. I am so happy and relieved that the drama did not drag on with the whole ‘Don’t-talk-to-me-I’m-going-to-ignore-you-because-I-don’t-want-you-to-misunderstand-that-we-can-date-when-really-we-can’t-because-you’re-in-high-school-and-i’m-an-adult” plot line. It was already solved by the end of this episode and I’m glad that Soo Young did not continue to deny her feelings. I know that her main issue was with Min Suk’s age, but when she looked past that, Min Suk really did have sincere and genuine feelings for her and that was what important in the end. I love how Soo Young attempted the habit that Min Suk would do in the past when they were dating. She clapped her hands and opened her arms wide open as if she was asking for a hug from Min Suk. That kind of served as her signal that she’s made up her mind and that it’s Min Suk that she chose because she still loves him. I love how they’ve already made up, but I’m just curious as to what’s going to happen to them now. Will they continue to keep their relationship a secret? Will they reveal it to everyone? What about Director Yoo? Is he still going to plead for chances from Soo Young or will he finally give up? I kind of felt like Yoo Ah was giving up on Min Suk the moment she revealed to her sister that Min Suk got injured and that Soo Young would be the only person able to comfort him. I’m so glad that she’s finally realizing that although she’s a great friend to Min Suk, she’s not as important to him as she thinks she is and that he admires her sister more than he admires her. We all know how stubborn Yoo Ah is. She didn’t have to tell Soo Young anything, but because of her inability to see Min Suk suffer the way he was suffering she told her sister. Yoo Ah might have a one-sided love towards Min Suk, but a part of that one-sided love includes caring for him and making sure he’s alright and if she can’t be the person to end his suffering then she’s got to find the one person that will be able to no matter how hurtful it is. She has this one-sided love for Min Suk, but I think it was in this episode that she’s finally come to terms and realizes that she’s not the one to provide that happiness that he yearns for. Instead it’s Soo Young and all Yoo Ah wants is for Min Suk to be happy so she will do whatever she can to make him happy. In a way, she’s sacrificing her happiness for his, but it doesn’t matter much to her because she cares so much more about Min Suk. To Yoo Ah it might be a very hard thing, but she shouldn’t be so sad. There still is Tae Suk, who I might add has been showing concern for Yoo Ah and answering her phone calls lately, and I don’t see him as a bad contender. He might not be as talented or well-rounded as Min Suk, but he is charming in his own unique individual ways and I’m pretty sure if Yoo Ah gave him a chance, she will start finding him attractive as well. I don’t think the idea of Tae Suk and Yoo Ah being a couple is anything bad. I kind of approve it. And the best thing about that is that they’re both in high school! (or at least we think they are, hahaha. Watch Tae Suk pull a Min Suk on Yoo Ah. King of High School season 2!). Haha, that’s a great prediction! I also thought about the possibility that Jin Woo and Yoo Ah could become a couple, but then I kind of ruled it out because their age difference is a bit too wide and it would be sort of weird. But then again, if Min Suk and Soo Young could date, then so can Yoo Ah and Jin Woo. I also noticed the difference in Jin Woo’s behavior when he was talking to Soo Young compared to when he was with Yoo Ah. I could see his eyes shining and his lips smirking when he was talking to Yoo Ah that one time in the restaurant, I was so fascinated by how happy he looked around her. Haha. I’m not expecting them to end up together by the end of the drama (wouldn’t really mind it either though, as long as Soo Young and Min Suk does that’s all I really care about), but I do see them getting closer to each other and strengthening their allies bond and friendship. This episode was by far the most difficult episode for me to watch. I had to pause the episode multiple times to get a grip of myself and to pull myself back together. I think it’s the fact that Min Suk can no longer play any hockey that hit me the hardest, because that’s what Min Suk loves doing and that’s all he’s known how to do so watching him give up on one of his passions was really hard for me to witness. Are we forgetting the fact that Min Suk is basically a high schooler while Soo Young is a full grown adult 9 older than Min Suk which could practically result in an unhealthy/dysfunctional/immature relationship due to the age/maturity gap or are we not addressing this issue…? I had fun reading your recap; thank you for that. It’s like reliving the episode. You learn from reading another person’s remarks, too. For example, I hadn’t realized that the car that splashed on MinSuk was Director Yoo’s. No wonder all the swearing! (I don’t like swearing, but sometimes MinSuk and his long string of swear words that are even bleeped in the Korean soundtrack just makes me laugh.) It was very stressful, but there has been a lot of progress. Bad as it was to lose hockey, I realize it would take something of that magnitude for the sisters to do a turn-around. Soo young was trying so hard to do the proper thing, she would not have come back without a compelling reason that he needed her. And YooAh had to see for herself that bulldozing her way through would not work and she was not the person he wanted. One thing I love about this show is that even through the most tragical episode, they still can shoehorn in some humor. 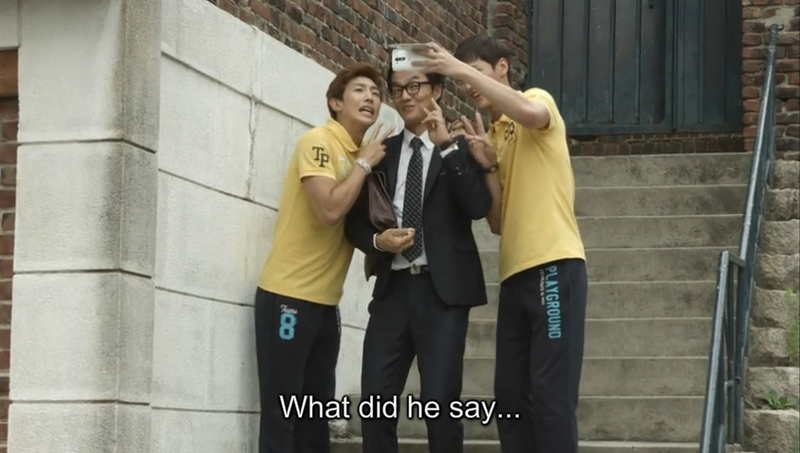 MinSuk’s friends and Manager Kim! Hahahaha! I love it. I think this drama is the best thing out there right now. May I ask what songs he sang in the karaoke room? one of those melodies was very nice! !